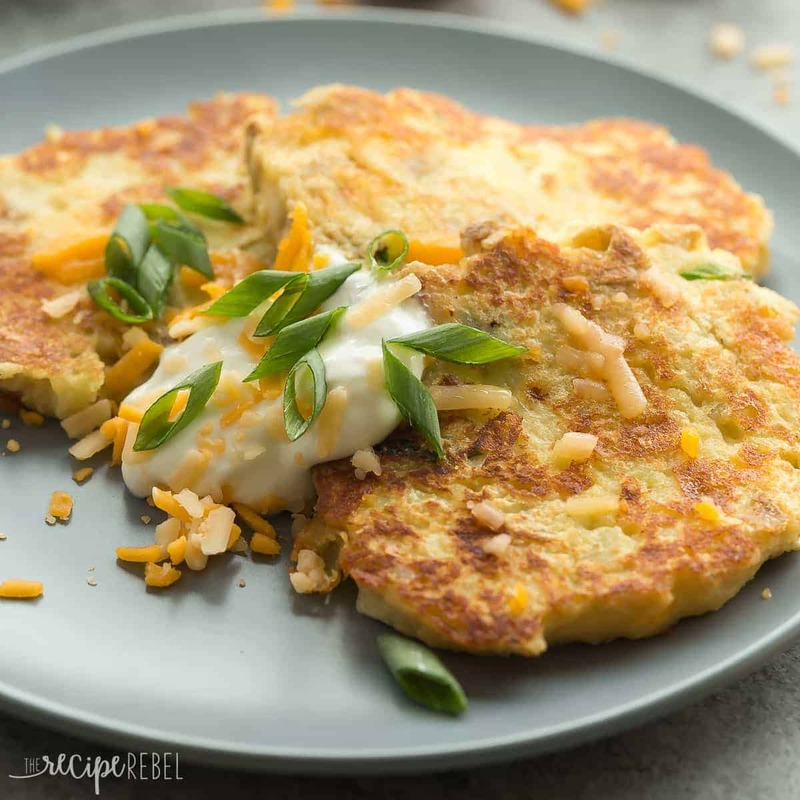 These Cheesy Mashed Potato Pancakes are one of the best ways to use up leftover mashed potatoes! Just 5 ingredients and a few minutes prep. I feel like I’ve been doing okay so far, my commitment to find you more comfort food recipes made healthier is helping to keep me on track. Because in the deep, dead cold of December, a girl needs her comfort food, right?! I am that girl who will never give up her favorite foods, and so compromise is my new favorite word. A compromise that don’t feel like a compromise. Potato pancakes are right up there on the list! 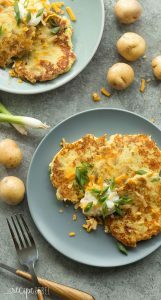 These Cheesy Mashed Potato Pancakes are so simple to make — just some leftover mashed potatoes (or freshly mashed!) and a handful of ingredients, a hot griddle, and a flipper. They are creamy on the inside, crispy on the outside and they go perfectly with just about anything. They could be breakfast with a side of bacon or sausage, or dinner paired with a roast, salad and some veggies! *This post is sponsored by The Little Potato Company as part of my ambassadorship with them and I was compensated for my time — thank you for supporting brands that support The Recipe Rebel! Let cook for 4-5 minutes until very golden and crispy, then flip and cook another 4-5 minutes until golden brown. Serve with sour cream, cheese and green onions or top as desired. If you're using previously seasoned mashed potatoes, you may want to skip the salt. If your potatoes were mashed with another liquid such as broth or milk, you will want to add 2-3 tablespoons flour to your potatoes before making your pancakes. If you’re using previously seasoned mashed potatoes, you may want to skip the salt. If your potatoes were mashed with another liquid such as broth or milk, you will want to add 2-3 tablespoons flour to your potatoes before making your pancakes. Can I make these and freeze them? If I can how would you suggest I warm them back up. Have to travel to my daughters for Christmas Brunch and thought these would be a nice surprise. My family has never had them. Hi Ashley! I love potatoes all ways, but these are really calling to me! Gary loves potato pancakes for breakfast and quite often makes a batch himself. I do love the little potatoes as they cook so quickly and are so creamy! Yes, they’re so great for breakfast the day after the holidays! They are a new favorite around here for sure. Thanks Dorothy! 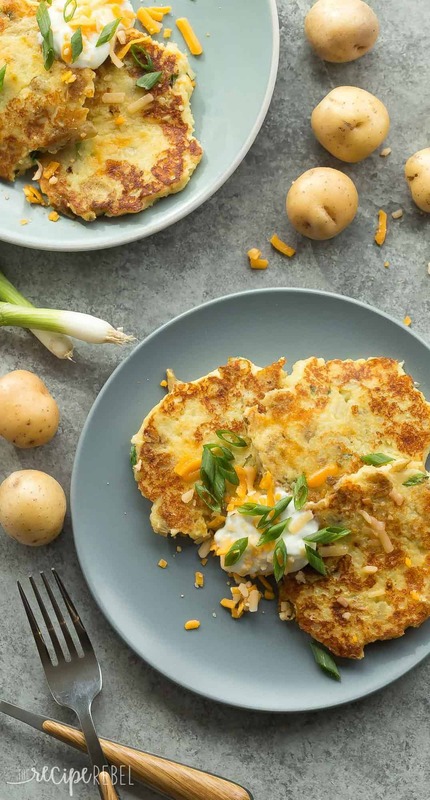 I loooooove mashed potato pancakes so much and I can hardly even stand how ultra-crispy and perfect these beauties look, Ashley! Total Monday food that I neeeeed! Yes! 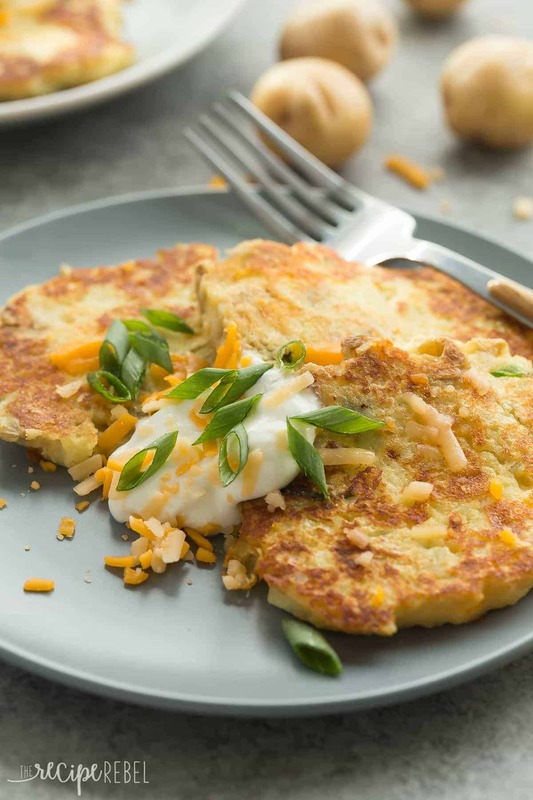 Monday is for cheesy potato pancakes 100%! I’ve never made mashed potato pancakes before, but I think I need to start! These look SO good, Ashley! I love how this could be a savory dinner, or even breakfast, because anytime is breakfast time, right? 🙂 Love the cheese in here! Totally an ANY time meal for sure! Thanks Gayle!